Trixie is a company that has become renowned for being able to cater for the vast majority of domesticated animals. When it comes to cats, they have a wide range of products that cover almost every aspect of cat care. One area where they really do excel is their cat trees. 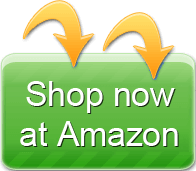 They have a wide range of models, all of which are suited for different cats and different domestic surroundings. Here we will look at some of the most popular trees that Trixie have on the market right now, and we’ll see if they are well suited for your home and your cats. 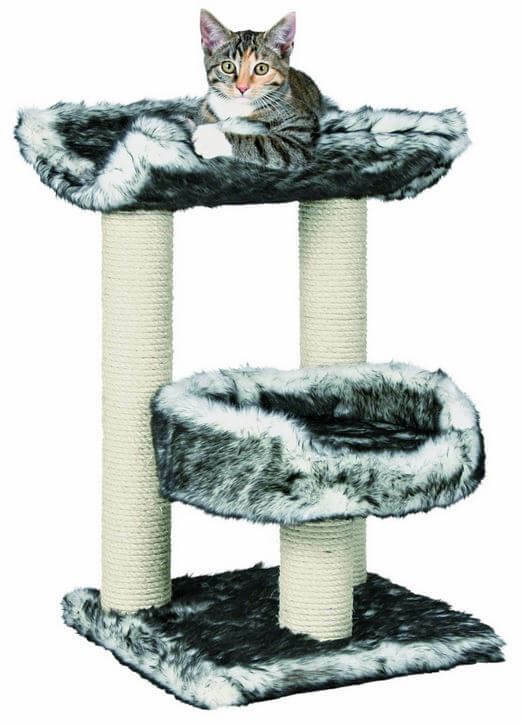 This cat tree is considered to be one of the models on offer that covers all the bases. Not only is it a great place for older cats to get comfortable and relax, but it also has enough room for cats to play and spend a little time exploring. This tree is covered with a very soft fabric that is ideal for cats when they want to sharpen their claws. The only real problem with this model is that the instructions that are provided can seem quite vague. This can be a bit of a problem when you consider how many different steps are required in order to put the whole thing together. Once you figure out how to put the major pieces of the tree together however, you should find that the whole thing is able to come together easily. It will just be dealing with the assembly during the early stages that will be the problem. After that your cats will have a very reliable tree. 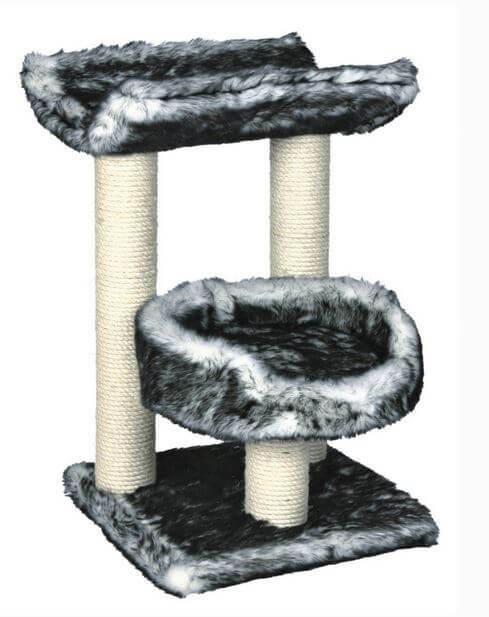 This is probably one of the most unique cat trees that you will find available on the market right now. It comes with an adjustable height feature, so then you can have the tree reaching all the way up to the ceiling from the floor. This naturally makes a wonderful place to relax and play for cats, particularly for kittens. They can have a great time climbing through the different levels all the way up to the top. Just like with the Belinda Cat Tree House, the only real problem arises when you are putting it together. As you would expect the Nataniel Adjustable Cat Tree is a little harder to put together, mainly because of all the different complicated parts that need to be put in the right place. You will probably find however that putting the effort in during assembly will be worth it, as your cats will probably spend large amounts of time playing and relaxing on this tree. Now we find ourselves at the other end of the spectrum with a cat tree that is altogether a lot more basic. 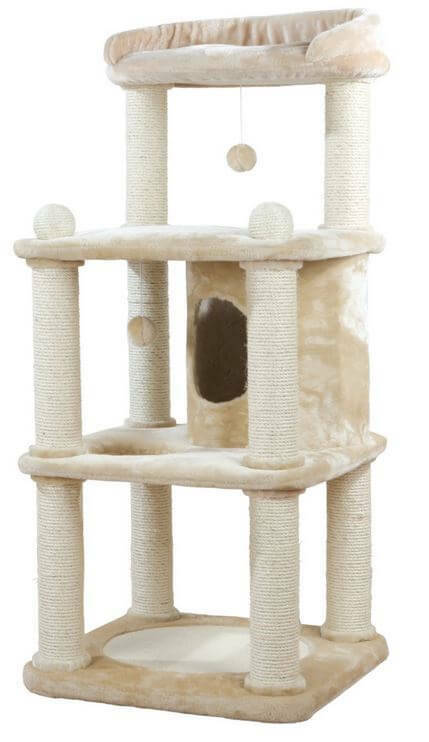 This one is ideal for older cats as it has only a few levels, and it comes with a nice comfortable condo where your cat is able to get comfortable and relax. This is certainly a tree that an older cat would appreciate. The only downside to this tree is that younger cats will probably not enjoy using it very much. The Alicante Cat Tree does not come with any toys or accessories, so they may find themselves getting bored with it in a very short space of time. If you have older cats however, then this is certainly a tree that will please them. The Isaba Cat Tree has been designed with the cat’s comfort and relaxation in mind. This tree comes with three beds, all of which are lined with long haired plush. This makes it extremely comfortable and the ideal place for a cat to get comfortable and unwind. This tree of course also comes with a couple of scratching posts, so then your cats are still able to sharpen their claws without causing any damage to the plush lining. 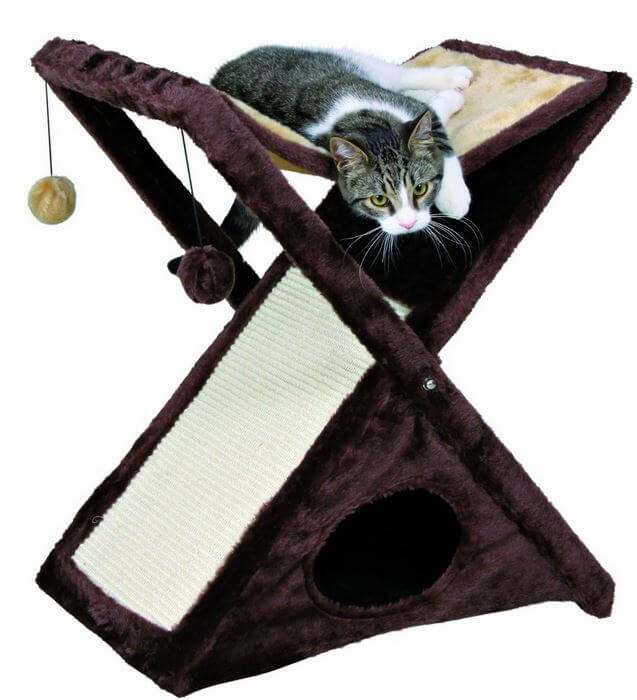 While this would be ideal for older cats, it can pose a problem for cats that are fairly large in size. If you have a big cat then they may find that the beds are considerably too small for them to get comfy in. The base of the cat tree is 14×14 approximately, which roughly means that a cat that weighs around 15 pounds will not be able to fit inside. If your cat is smaller than 15 pounds however, then it should be able to climb inside and get very comfortable easily. The Miguel Fold and Store Cat Tower is the ideal cat tree for people who do not have a lot of room spare for a tree. This tree can be discreetly folded away whenever the cat is not around, and then folded back out again whenever the cat is looking for somewhere to get comfortable and relax. The hammock at the top of the tree is ideal for a cat that is just looking to kick back and relax for the day. The only real downside to this tree is that the toy balls that are connected to the tree can sometimes break off quite easily. One some occasions they can fall down after very little contact. This of course will not be a problem for a cat that doesn’t really play that often, but this can be a little bit of a problem if you have kittens. 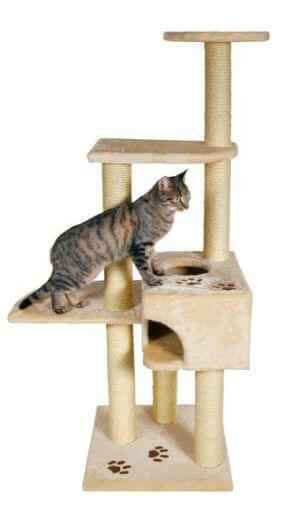 If you have an older cat however, then this fold-away cat tree will be perfect for them to get comfortable and rest. 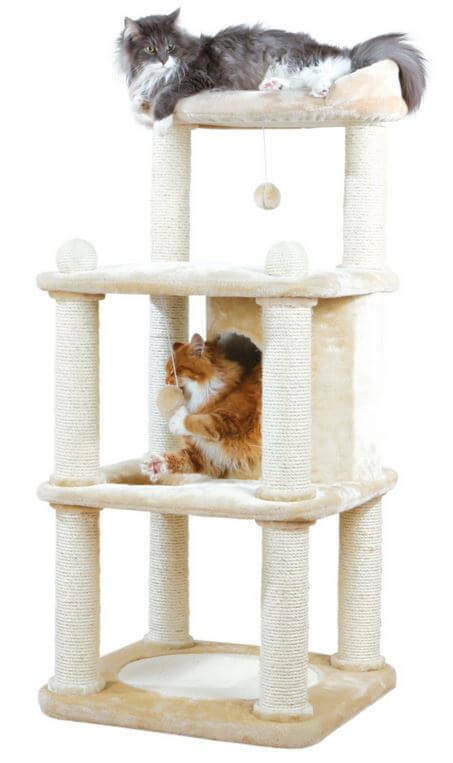 Considering the range of different cat trees they have available, Trixie have to be considered one of the leaders on the market. They have models that are nice and small and compact, while they have others that are able to take up loads of space and keep plenty of cats entertained for hours. Regardless of your needs, you can almost guarantee that Trixie has the right tree for you, your cats and your home.